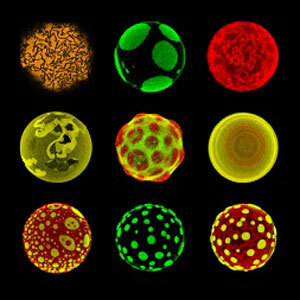 (Nanowerk News) Protocells are the simplest, most primitive living systems, you can think of. The oldest ancestor of life on Earth was a protocell, and when we see, what it eventually managed to evolve into, we understand why science is so fascinated with protocells. If science can create an artificial protocell, we get a very basic ingredient for creating more advanced artificial life. However, creating an artificial protocell is far from simple, and so far no one has managed to do that. One of the challenges is to create the information strings that can be inherited by cell offspring, including protocells. Such information strings are like modern DNA or RNA strings, and they are needed to control cell metabolism and provide the cell with instructions about how to divide. If one daughter cell after a division has a slightly altered information (maybe it provides a slightly faster metabolism), they may be more fit to survive. Therefor it may be selected and an evolution has started. Now researchers from the Center for Fundamental Living Technology (FLINT), Department of Physics, Chemistry and Pharmacy, University of Southern Denmark, describe in the journal Europhysics Letters ("Structure and selection in an autocatalytic binary polymer model"), how they, in a virtual computer experiment, have discovered information strings with peculiar properties. Firstly long molecular strings are decomposed in water. This means that long information strings "break" quickly in water and turn into many short strings. Thus it is very difficult to maintain a population of long strings over time. Secondly, it is difficult to make these molecules replicate without the use of modern enzymes, whereas it is easier to make a so-called ligation. A ligation is to connect any combination of two shorter strings into a longer string, assisted by another matching longer string. Ligation is the mechanism used by the SDU-researchers. "In our computer simulation - our virtual molecular laboratory – information strings began to replicate quickly and efficiently as expected. However, we were struck to see that the system quickly developed an equal number of short and long information strings and further that a strong pattern selection on the strings had occurred. We could see that only very specific information patterns on the strings were to be seen in the surviving strings. We were puzzled: How could such a coordinated selection of strings occur, when we knew that we had not programmed it. The explanation had to be found in the way the strings interacted with each other", explains Steen Rasmussen. According to Steen Rasmussen, a so-called self-organizing autocatalytic network was created in the virtual pot, into which he and his colleagues poured the ingredients for information strings. An autocatalytic network is a network of molecules, which catalyze each other's production. Each molecule can be formed by at least one chemical reaction in the network, and each reaction can be catalyzed by at least one other molecule in the network. This process will create a network that exhibits a primitive form of metabolism and an information system that replicates itself from generation to generation. "An autocatalytic network works like a community; each molecule is a citizen who interacts with other citizens and together they help create a society", explains Steen Rasmussen. This autocatalytic set quickly evolved into a state where strings of all lengths existed in equal concentrations, which is not what is usually found. Further, the selected strings had strikingly similar patterns, which is also unusual. "We might have discovered a process similar to the processes that initially sparked the first life. We of course don’t know if life actually was created this way - but it could have been one of the steps. Perhaps a similar process created sufficiently high concentrations of longer information strings when the first protocell was created", explains Steen Rasmussen. The mechanisms underlying the formation and selection of effective information strings are not only interesting for the researchers who are working to create protocells. They also have value to researchers working with tomorrow's technology, like they do at the FLINT Center. "We seek ways to develop technology that’s based on living and life-like processes. If we succeed, we will have a world where technological devices can repair themselves, develop new properties and be re-used. For example a computer made of biological materials poses very different - and less environmentally stressful - requirements for production and disposal", says Steen Rasmussen.